This Flat Power Bank features an LED indicator light and charges your USB products. The strap doubles as a charging cable. 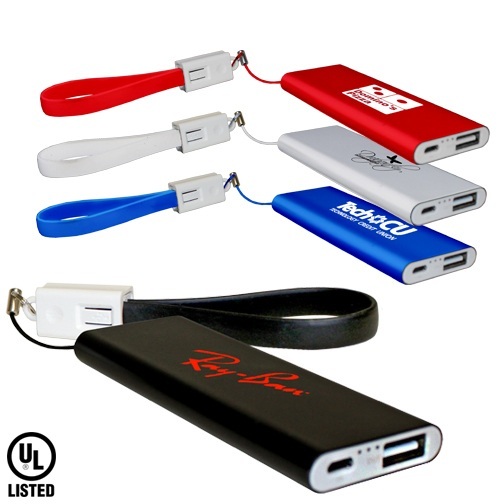 This Flat Power Bank charges USB products on the go, has an LED indicator light and is UL listed and FCC approved. The lithium ion battery is included. 2200mAh with 5V output. The strap doubles as a charging cable. Each Flat Power Bank is individually boxed. Flat Power Banks are available in Black, Blue, Silver and Red. Pricing for the Flat Power Bank with Cable includes a 1-color imprint on the top panel. Additional charges apply for multi-position imprint. Optional laser engraving is available for additional charge. Laser engraving appears white. Contact us for additional charges. Full color digital imprint is also available on our Flat Power Bank with Cable. Contact us for pricing. Black, White, Red, Light Blue, Medium Blue, Dark Blue, Light Green, Medium Green, Dark Green, Brown, Purple, Teal, Yellow, Orange, Maroon, Athletic Gold, Gold, Silver.